WHEN Jay Allen discovered he had a melanoma skin cancer, it was a life-changing moment. But the 39-year-old father of four is now glad he still has a life to change. Mr Allen and fellow skin cancer survivor Andrew Rust completed a charity walk from Sydney to Melbourne last week to raise money for the Melanoma Institute to fund melanoma cure research. Mr Allen shared his story at a talk at Frankston’s Peninsula Skin Cancer Clinic and told The Times the walk was part of his personal cancer survival journey. It was 2008 when the former truck driver noticed a mole on his left ankle had begun to “scab up and bleed when scratched”. Being a truckie he thought his work boots had been rubbing against the mole and dismissed it as a nothing much to worry about. Luckily, his wife Janine was not so blasé. She insisted he see a doctor after the “scab” did not heal after several months. Mr Allen was then stunned to discover his mole had developed into a skin cancer. A follow-up visit to a specialist and surgery to remove the leg melanoma confirmed the cancer had spread to lymph nodes in his groin. The moment Mr Allen was told the cancer had metasised was featured on Channel 9’s RPA TV show, filmed at the Royal Prince Alfred Hospital in Sydney. “It was a scary time and I was really worried when I was told the cancer had spread to other parts of my body,” Mr Allen said. Sydney Melanoma Clinic plastic surgeon Dr Michael Quinn told Mr Allen that the survival rate for patients with advanced melanoma “is not very good” and sixty per cent would be alive within five years of diagnosis. 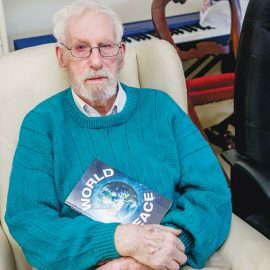 Thankfully, the cancer had not spread further but Mr Allen had to wait several agonising weeks before being given the “all clear” after lymph nodes in his groin were removed. After his cancer scare, Mr Allen decided to become involved in helping others deal with the confronting nature of melanoma diagnosis. He co-founded a patients’ support network for melanoma patients in Sydney and is now a full-time community campaign coordinator at the Melanoma Institute. “There’s no cure for advanced melanoma and I wanted to give something back to those who had saved my life by also trying to raise as much money as possible for medical resources,” he said. A support crew of nine supported Mr Allen and Mr Rust in their 900 kilometre walk in 15 days from Sydney to Melbourne. The duo’s efforts have raised more than $150,000 for research to hopefully find a cure for advanced melanoma. Mr Allen said the pair had been “rapt” at the support shown by everyone they met on their long walk that ended at the MCG during the half-time break of the AFL game between Hawthorn and Sydney on Saturday 26 July. Motorists “honked their horns” in support and many stopped to chat and donated money along the way. 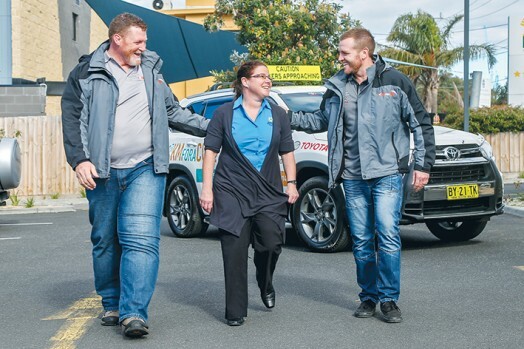 The Peninsula Skin Cancer Clinic in Frankston donated $5000 to the campaign and performed 900 skin checks, one for each kilometre Mr Allen and Mr Rust walked, in the fortnight. “Jay and Andrew’s walk has really helped raised awareness of the importance of early detection in the prevention of melanoma,” PSCC melanographer Sue Dixon said. Ms Dixon said 18 melanomas had been detected in the 900 skin checks they performed, adding to the average annual total of 300 melanomas detected at the centre each year. Mr Allen thanked Ms Dixon and staff at the PSCC for their support. “It’s so important for people to get their skin checked out at a proper skin clinic at least once a year,” he said. See www.peninsulaskincancercentre.com.au for skin check details and www.everydayhero.com.au/event/900KMFORACURE2014 to donate money for melanoma cure research.